You don't need lessons. There's no expensive equipment to buy. And your shins won't ache at the end of the day. It's no wonder that here in New England, snow tubing has become a popular alternative to skiing. 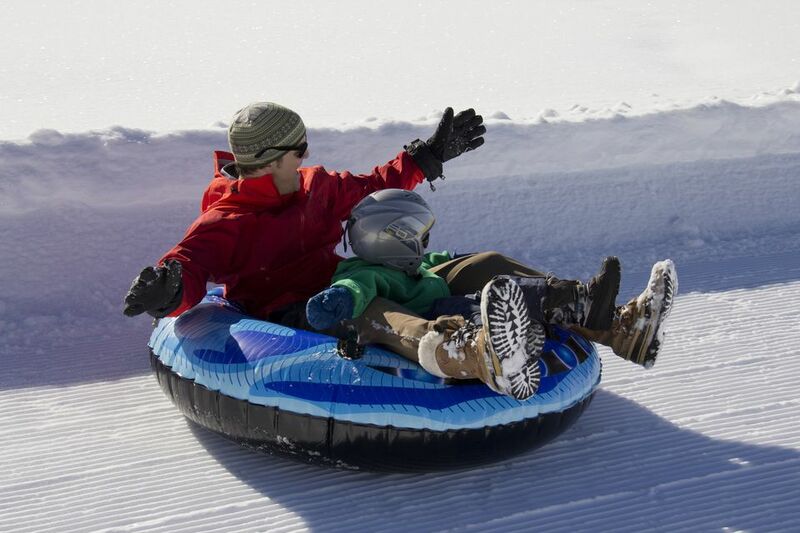 With more than a dozen New England tubing parks offering fast-paced fun, families visiting the region this winter will find ample opportunities to give tubing a try. Here is your guide to tubing in Connecticut, Maine, Massachusetts, New Hampshire and Vermont. Woodbury Ski Area: With 14 snow tubing runs served by two lifts, Woodbury Ski Area in Woodbury, Connecticut, is southern New England's largest tubing destination. It's also the closest New England tubing park to New York City. Powder Ridge: This Middlefield, Connecticut, ski area is back from the dead with a whole new assortment of winter enticements including multiple snow tubing runs. The most extreme trail goes all the way down the mountain. Helmets are required and provided free of charge. Seacoast Snow Park: When winter rolls around, Seacoast Adventure Park in Windham, Maine, is transformed into a snow park with about a dozen tubing lanes and a carpet lift. Snowmaking ensures good conditions for sledders, and music and lights make this a fun spot to be at night, too. Sunday River: The lift-serviced Tubing Park at Sunday River ski area in Newry, Maine, is available select weekends and holidays from 4 to 8 pm. Mt. Abram: Two tubing lanes — including the longest tubing run in Maine — are available at this compact ski area in Greenwood, Maine. Ski Butternut: Don't ski? A Massachusetts tubing outing at the Ski Butternut Tubing Center in Great Barrington, Massachusetts, is the perfect winter cabin fever beater. Snow tubing is exhilarating and fun for kids and adults. Berkshire East: Charlemont, Massachusetts, is home to the Berkshire East ski area and its tubing park. A moving ground lift takes all of the work out of climbing back up the hill after each tubing run. Nashoba Valley Ski Area: Nashoba Valley's Tubing Park in Littleton, Massachusetts, operates seven days and nights each week during the winter season. With 18 tubing lanes, four lifts and an on-site lodge, it's a premier tubing destination in New England and the closest tubing location near Boston. Ski Ward TubaSlide: The TubaSlide at Ski Ward in Shrewsbury, Massachusetts, offers tubing excitement daily for ages 6 and up (42" height requirement). Active duty military personnel save 50 percent on tubing tickets with valid ID. Cranmore Mountain Resort: Visiting North Conway, New Hampshire, this winter? Then why not try tubing at Cranmore's Tubing Park? All ages are welcome (children must be at least 42" tall to ride solo), and with 10 runs, two lifts, snowmaking, and lights, you're sure to have a memorable outing. Granite Gorge: New England's rock-and-roll snow tubing park in Keene, New Hampshire, has a full-mountain sound system, lighting for night tubing and both single and two-person tubes. Granite Gorge offers to tube Wednesday through Sunday for ages 5 and up (42" height requirement). Cosmic Tubing from 6-9 p.m. on Saturdays makes for a perfect date night. King Pine: The Pine Meadows Snowtubing Park at King Pine Ski Area in East Madison, New Hampshire, is one of the cheapest places to tube in New England. Tickets are just $19 for a two-hour session as of 2018, and you can tube for just $10 on Tuesday, Thursday and Sunday nights. Loon Mountain: Loon Mountain in Lincoln, New Hampshire, offers tubing excitement day and night with chairlift service to maximize your ride time. A separate tot tubing area is available for children under 8 years of age. Pats Peak: You must lay down on your belly if you want to tube at Pats Peak in Henniker, New Hampshire, where corporate and other groups can rent the entire tubing park for private events. Public tubing sessions are available Friday through Sunday and during holiday vacation weeks. Grafton Ponds Outdoor Center: Although Grafton Ponds in Grafton, Vermont, is primarily a Nordic skiing center, tubes are available for rent for use on a single, 600-foot tubing run. Magic Mountain: Magic Mountain in Londonderry, Vermont, is home to the Alakazam Tube Park, which is as much fun as it sounds! Tube all day for a single price on weekends and during holiday periods. Mount Snow: With multiple lift-serviced lanes of tubing action, Mount Snow's tubing hill offers a fun alternative to skiing for families visiting Friday through Sunday and holidays.